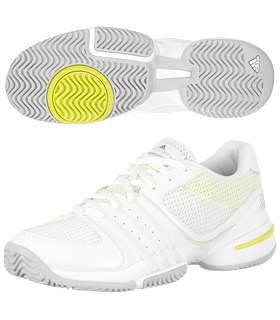 The tennis styles of today are a combination of form and function – not only are they attractive, but they are crafted from high-performance fabrics that keep an athletic body cool and comfortable! Modern fabrics are “breathable” – meaning they keep you cool and dry, even when it is very hot outside. 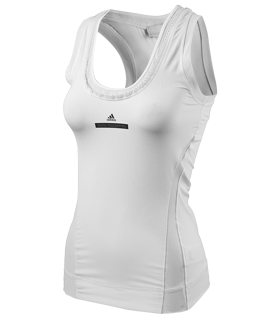 They also hold their shape – ensuring that the athlete looks good before and after a match! 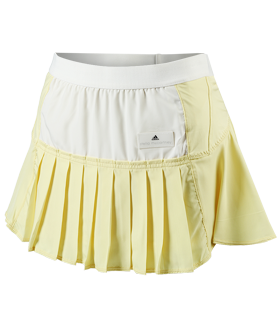 Here are the qualities for a variety of fabrics you might want to consider when choosing on-court attire. 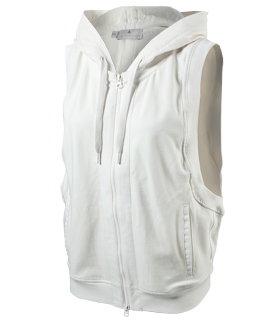 Soft, cool and comfortable - cotton absorbs sweat and releases it quickly, allowing for breathability. As it is non-allergenic, cotton does not irritate the skin. It sometimes requires pressing, but it is durable and it wears well. Cotton blends easily with most other fabrics including synthetics like polyester and Lycra. Cotton-blends provide comfort, performance and they move well. Clothing made from Lycra® provides many advantages: it is lightweight, breathable and comfortable, and it can stretch – up to 500% without breaking! Quick drying, this fabric also dyes well, and it is resistant to bacteria, UV rays and chlorine. There is no worry of static cling or pilling with Lycra® and it is very durable. Rayon is a man-made fiber composed of regenerated cellulose which is obtained from wood pulp. Rayon is very versatile and it can be as comfortable as cotton. In fact, rayon can imitate the texture and feeling of silk, wool, cotton or linen. 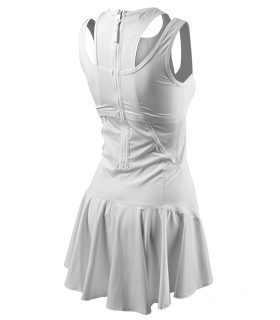 While rayon fabrics are very absorbent, they do not insulate body heat, making them ideal for sportswear. 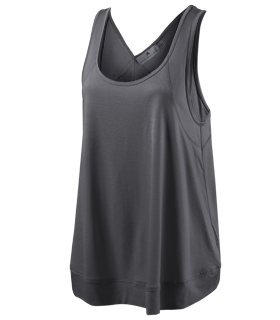 Offering a great combination of comfort and fit, spandex is lightweight, soft and smooth. Its resistance to lotions, detergents, body oils and perspiration, make it a very good fabric for athletes. Similar to Lycra, it can be stretched to 500% without breaking and it snaps back to its original shape with continual stretching, which prevents sagging in many spandex- blend garments. Many companies have their own versions of cotton-poly-blends that wick away moisture and keep athletes cool – look for fabrics with Luon®, Coolmax®, Silverescent® or Dri-Fit from Nike. On-court tantrums…we’ve all seen ‘em. While throwing fits seems to be part of the genetic makeup of some tennis players, for most…it just doesn’t seem to help. Case in point – Andy Roddick - it seems that the more visibly upset Andy gets, the worse he plays and the worse he plays the more upset he gets – a vicious spiral! Keeping cool on court – both mentally and physically - is crucial to a successful tennis match. Check out these tips! 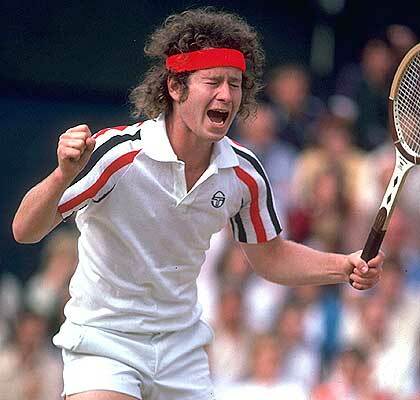 reacts to an umpire's call at Wimbledon in 1980. BUILD A SOLID BASE. Energy drain can affect the mind. Therefore, it is important to boost cardiovascular fitness for good mental stamina. Also, focus on core strength – which can be built with sit-ups, planks crunches, lunges and swimming. Core strength enhances the serve, improves balance and puts extra “pop” into ground strokes! KEEP YOUR MIND IN THE PRESENT. From the beginning to the end of the match - focus on the current point. Concentrate on the return of each and every ball. Sometimes counting your returns - from the serve onward - can help. Many players try to adopt this mindset only after they start making errors, which may be too late. Players who start out with this strategy are much more consistent. PRACTICE MAKES PERFECT. Emotional reactions on court are HABITS. Whether you are aware of it or not, they are learned and practiced! Players who practice being negative get really good at being negative – sound familiar? On the flipside, a positive attitude on court also takes practice. With each error, make a conscious decision to let negative feelings pass and move on to the next point with a level head. PACE YOURSELF. If you are ahead, try to maintain the pace. Attempting to speed up the match can cause errors and affect momentum. However, if you are losing, it may help to slow down just a bit to regain your focus. Remember, 25 seconds is allowed between each point. If you need to, turn away between points - straighten strings, towel off and engage in self-talk. Tell yourself to calm down or pump yourself up – whatever it takes, but keep it positive! NEVER LET ‘EM SEE YOU SWEAT. Visible irritation with your own performance does two things. 1. It makes YOU feel bad – not only did you just make an error, but your opponent knows your upset about it. Your chances of making another error: pretty good. 2. It makes YOUR OPPONENT feel empowered! They’ve got you right where they want you. Chances for your opponent to hit a winner in the next point: pretty decent! All in all, having a good mental strategy for going into a match is important. Channel your inner “Rafa Nadal” (with his “Tigger-like” bounce prior to every match) to boost energy, and evoke “Roger Federer” to keep calm, collected and cool throughout the match! Professional tennis player, Lindsay Ann Davenport, has won three Grand Slam singles titles and an Olympic gold medal in women’s singles tennis. According to Tennis Magazine, Davenport is one of the best female players of the modern era – in 2005 she ranked as the 29th best player of the previous 40 years. Her game is built on consistency and power, featuring a strong serve, solid ground strokes and an excellent, two-handed backhand. One of only four women who have held the number one ranking at least four times since 1975, Davenport finished 1998, 2001, 2004 and 2005 with this prestigious title. The other players to achieve this feat were Chris Evert, Steffi Graf and Martina Navratilova. 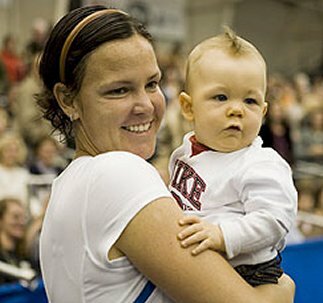 Lindsay Davenport is the daughter of Wink and Ann Davenport. Not surprisingly, her father was also an athlete who participated in the 1968 Summer Olympics as a member of the U. S. volleyball team. Growing up, Lindsay attended schools in Palos Verdes Peninsula and Murrieta – both in California. In 2003, Davenport married former USC All-American tennis player-turned investment banker, Jon Leach. Jon is the brother of Rick Leach, another professional tennis player. Late in 2006, Davenport took a breather from competitive tennis to have a baby boy - Jagger Jonathan - born on June 10, 2007 in Newport Beach, California. Intending to play in the 2009 Australian Open, Lindsay withdrew when she learned of another pregnancy. She gave birth to a baby girl, Lauren Andrus, on June 27, 2009 – also in Newport Beach. Returning to competition in 2010, Lindsay Davenport and Bob Bryan received a wild-card slot to play mixed doubles at Wimbledon. They made it to the second round where they were defeated by Daniel Nestor and Bethanie Mattek-Sands. Also in 2010, Davenport played women’s doubles with partner Liezel Huber at the Bank of the West Classic, where they won the title, and at the Mercury Insurance Open, where they were defeated in the quarterfinals by Bethanie Mattek-Sands and Yan Zi. Currently, Lindsay Davenport resides with her family in Irvine California and also owns a home in Laguna Beach, California. She works as a Grand Slam commentator for the Tennis Channel and has been involved in a variety of exhibitions. At the recent 2011 French Open, she and partner Martina Hingis won the Women’s Legends Doubles Title. Adult tennis aficionados occasionally pass their love for the game on to their pint-sized offspring. And with rock stars like Roger Federer and Rafael Nadal, tennis is definitely gaining in popularity among teenagers and young adults. 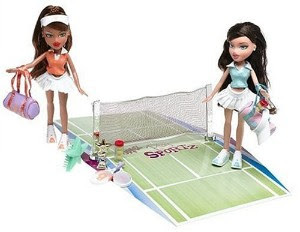 Check out these terrific and trendy toys for little and not-so-little lovers of tennis! 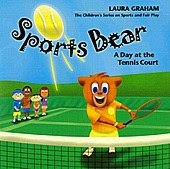 Little tennis lovers might also enjoy Frog Tennis , available at Amazon.com for $34.90 and at many department stores. Simply flip the frog over the net using a button-activated racquet in this fast-action game with electronic sounds – “ribbits,” “croaks” and “splashes” whenever the frog hits the pond! Score a point when your opponent misses a volley – the first to five wins! Ideal for kids ages six and up. These cute and cuddly stuffed animals are available at mysportsbaby.com. These little tennis critters are fun for folks from five to fifty! Get these awesome bendable figures - Tennis Pro Joe Bender ($8.79) and Ace Jane Bender ($8.95) – from Amazon.com . The 3 x 1 x 3 inch characters and accessories are all packed inside a 3" round tin. Recommended for ages 6 to adult, they are made from durable, plastic-coated wire which can bend every which-way and there are magnets in the hands and feet. 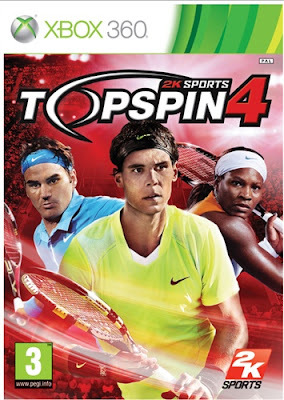 Finally for the not-so-little kids, there’s Topspin 4 for Xbox 360 , which can be found at Amazon.com for $36.99. This action-packed and challenging video game will test the knowledge and skills of any tennis lover. This great game is also available for PS3 and Wii. These are just a few of the great tennis toys and games on the market. Stayed tuned for more in a future post!